Place unsweetened chocolate in 9-inch square pan. Add oil; place in oven. Heat 4 min. or until chocolate is melted; stir until blended. Add next 6 ingredients; stir until blended. Stir in semi-sweet chocolate. Bake 30 to 35 min. or until toothpick inserted in centre comes out clean. Run knife around sides of pan to loosen cake; cool completely. 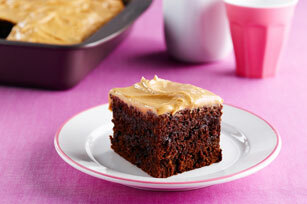 Mix peanut butter and icing sugar until blended; spread onto cake. Frosted cake can be stored in refrigerator up to 3 days.